Welcome to Pappy’s Play Area. We have some old fashioned games and activities as well as fun new ones to enjoy. 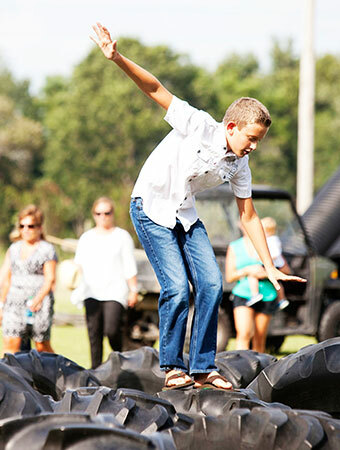 Some of these include duck races, feeding our farm animals, mouse races, bull roping, a giant slide and more. Scroll down to see what is new for 2015 and what fun things we have on our farm. This is a giant inflatable jumping pillow that provides kids and adults of all ages a guaranteed fun time. The flat surface allows for children and adults to jump at the same time. This is going to be an awesome addition to our farm this fall. 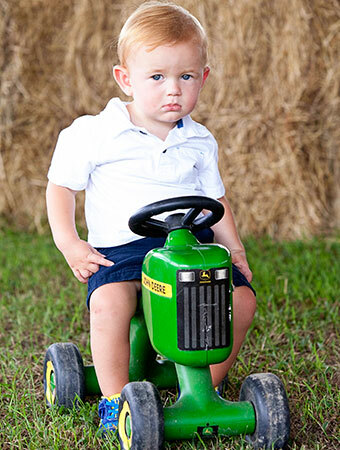 Your little ones can race around on tricycles and become a little Farm Racer. These trikes are in the shaded area of Pappy’s Play Area so that children can get out of the sun and race around our new track. 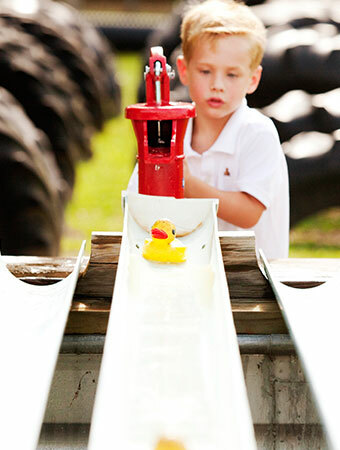 Race your ducks down the luge using antique water pumps. This is guaranteed to be a splashing fun time! 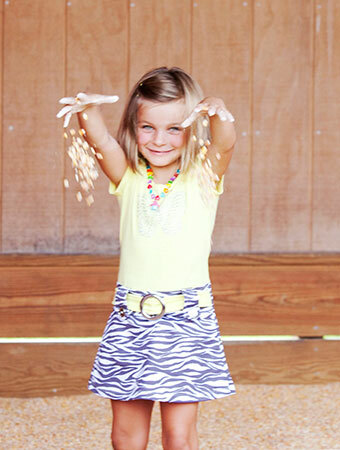 Nothing is more fun than playing in the Giant Corn Box. The Dried Corn Box houses tons of dried corn for playtime fun. 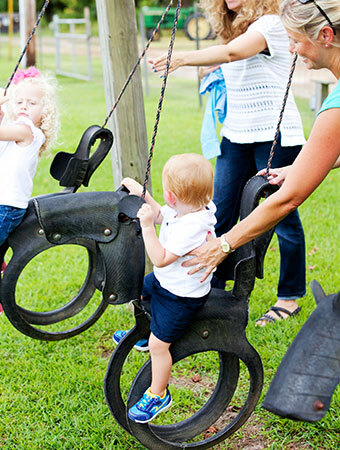 Our horse swings are a staple on Thompson Farm. All the kids love to swing on these handmade tire horses. 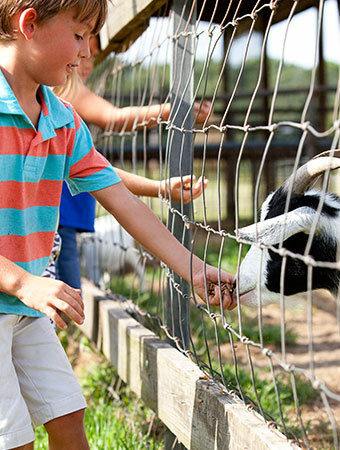 Check out our Meet the Animals section to learn about all the animals we have on the farm. We have everything from potbelly pigs to Watusi Cattle. While you are on the farm make sure you say hello to all of our beloved animals and stop by Edna’s Critter Barn. 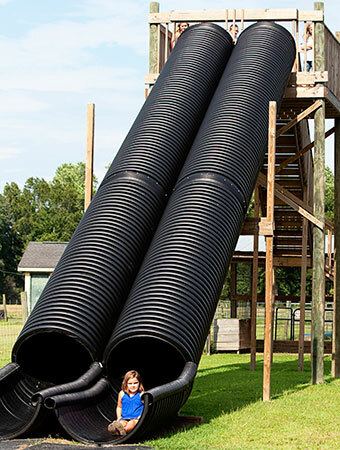 Adults and kids alike enjoy our 20ft slide year after year. This is always a great photo op as well. We have many sizes of tires to climb on, in, and around. This is not your normal balance beam. 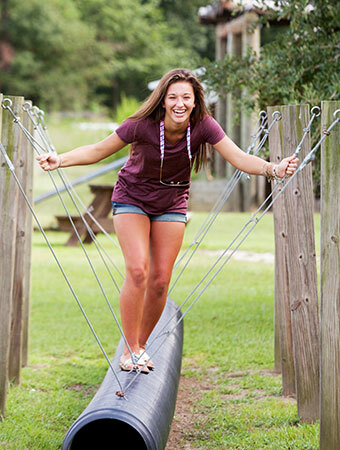 We invite you to see how well you can maneuver on our balance beam. 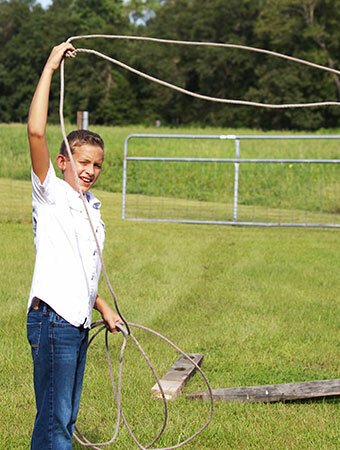 Who would not want to learn how to rope cattle on our farm? This is great way to learn and rope a few cows. 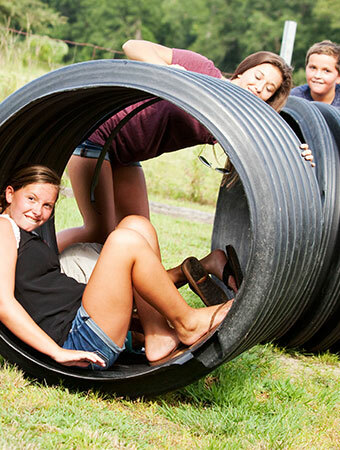 Kids can climb into these barrels and roll each other around for some good old fashioned fun.